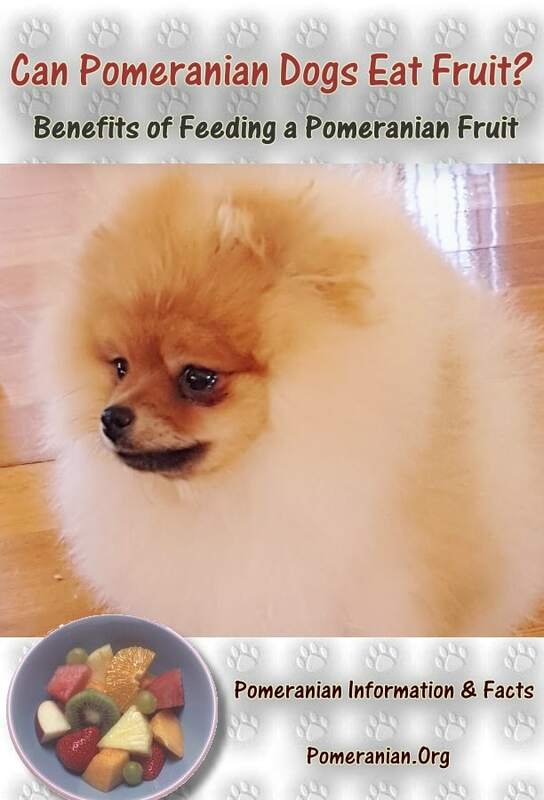 1.1 Here are the reasons why you need to pay attention when thinking about the right fruits to feed your Pomeranian. 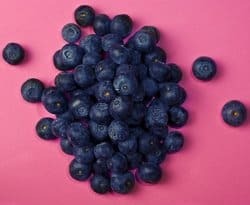 1.2 What are Fruit Safe for Dogs? 1.2.1 What Fruits Can Puppies Eat? 1.3.1 This is a list of the fruits safe for dogs. 1.4 Fruits that a dog may eat but be aware of the risks. List of fruit safe for dogs. A big part of caring for your Pomeranian is to ensure he’s eating the right variety of foods to get sufficient vital nutrients. Some people use kibble more often while others will use more wet food. It’s best to feed him a combination of both food groups but that’s not the end of the list. Fruit should also be part of his healthy diet. You may find that the foods you’re using don’t provide him with all the essentials and this is where fruit comes into the picture. But why fruit? What makes it an important part of your beloved Pom’s diet? Here are the reasons why you need to pay attention when thinking about the right fruits to feed your Pomeranian. Full of nutrients and vitamins and are low in calories (mostly). • Full of antioxidants which are capable of preventing lots of diseases and contributing to a longer life span. • Safe for consumption by dogs. • Easy to feed your Pomeranian. • Capable of being used in many ways and may help your dog eat other foods that might be a little less palatable. Nutrition. Fruit is full of nutrients, minerals and vitamins essential to a dog’s good health. The actual content levels will vary from fruit to fruit. Some have large amounts of vitamin C. Many fruits also contain vitamins K and A as well as zinc, iron and/or potassium. How each of these will benefit your Pom will be explained further down. Antioxidants protect the body’s cells from becoming damaged, thereby making it easier for diseases to strike. Antioxidants battle free radicals that cause this damage in the first place. Scientists are still studying the enormous benefits of antioxidants but it’s already accepted that they help protect against diabetes, cardiovascular disease, certain forms of cancer, and age-specific muscular degeneration. They also boost the immune system. Low in calories. Most fruits are low in calories. Pomeranians don’t usually have weight problems but it’s still wise to feed them low calorie foods when possible. This will be extra beneficial for senior Poms because they’re more likely to lead a sedentary lifestyle and gain weight. Low GI. Many fruits are low on the glycaemic index (the rate at which sugar gets absorbed into your pet’s bloodstream. 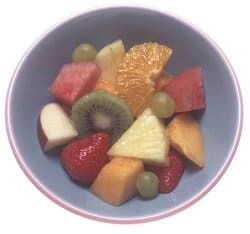 Lots of fruits contain fibre that helps prevent high sugar levels unless you give him too much fruit in one meal. Versatile to use. The majority of fruits are easy to include in a Pomeranian’s diet. Some may be for snacks and others can be added to a regular meal. Small pieces can be included in his kibble for additional flavour and texture, as well as added incentive to eat. Great reward treat. Fruit is an ideal treat when training your Pom. It’s essential to use different treats for training than you would for other reasons. Then your dog will understand that he needs to be obedient to get the fruit treat. However, you need to identify the fruits he enjoys the most, and that can take time considering just how many different fruits exist. Some are seasonal so it’s wise to have substitutes for fruits not currently growing. Healthy to eat. Fruits are wholesome foods to eat. Instead of buying foods that are laden with chemicals (flavourings, preservatives, additives and colouring), fruit will help keep your Pomeranian healthy. Always wash fruit before eating it yourself or feeding it to your beloved Pomeranian to ensure complete cleanliness. What are Fruit Safe for Dogs? All foods should be eaten in moderation. Too many carbs, too much sugar or fat and not enough protein can lead to an unbalanced diet. Your dog won’t be healthy if all he eats is fruit. However, snack ideas can’t get any better than fruit. What Fruits Can Puppies Eat? These berries sit at the top of the fruit list for dogs. They contain more antioxidants than any other fruits, seasonings or vegetables. Most of the antioxidants are phytonutrients and anthocyanins (a phytonutrient) makes the berry a dark colour. These berries are also excellent anti-inflammatories. The best blueberry is a raw, organic blueberry. Cooking kills most of the nutrients. Human research groups have revealed that blueberries help improve cognitive function and memory. It’s harder to study dogs for these specific issues. However, canine studies have revealed that heart disease can be prevented and cancers such as small intestine, colon, breast and oesophageal can be reduced in strength. Pomeranians LOVE blueberries. They’re easy to mix with his food or give him some as a snack. But be careful or he’ll start begging for more all the time. If your adult Pom is having other fruits, don’t give him more than ¼ cup of blueberries per day. Puppies should have half this amount. Mix them well into his food so he doesn’t selectively eat them and ignore everything else in his bowl. The berries can be frozen for up to six months as it doesn’t affect their healthy attributes. Dogs love the frozen berries in Summer. Raspberries. Raspberries are almost as good as blueberries in many ways. Organic raspberries are much healthier than non-organic varieties due to a higher level of antioxidants. Raspberries should be bought when they’re bright red and need to be used up within a maximum of three days. 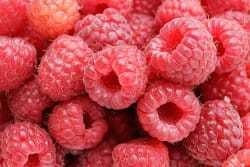 Health properties: Raspberries have anti-cancer properties, mainly due to phytonutrients (as with blueberries). The cancers affected are: prostate, colon, cervical, oesophageal and breast. Nutrition: A ¼ cup of raspberries has a mere 17 calories. They have lots of vitamins and minerals including: vitamins E, C and K, folate, copper, fibre, magnesium, biotin, omega-3 fats, manganese and potassium. The GI number is 40, as with blueberries. Diet: The principles for using raspberries are mainly the same as with blueberries. Pumpkin. Pumpkin isn’t like most other fruits because it can’t be fed to your Pomeranian regularly. It has major benefits in specific situations which is why it’s high on the list of good fruits. Firstly, this information solely relates to 100% pumpkin, not a can you buy at the supermarket that contains a pumpkin pie filling. Always read labels before making a purchase and you really should spend most of your time in the fresh produce section. Benefits of pumpkin: It can ease constipation, diarrhoea and an upset stomach. If your Pomeranian has these issues, feed him some pumpkin until the problem settles. If he has diarrhoea, his stool will return to normal. If he had constipation, he should be able to do his business normally once more. An upset stomach will calm itself down. Pumpkin has plenty of soluble fibre which helps make your Pom “more regular,” instead of being at one extreme end of the spectrum. However, you only feed him two teaspoons if he’s an adult or one teaspoon for puppies. This can be included in a meal of plain chicken and bland rice. Pumpkin can treat coprophagia. This is when he eats either his own faeces or that of other dogs and/or cats. Stress and an unbalanced diet are reasons why this problem may manifest itself. Add a spoon of pumpkin to help with digestion and change the taste of his faeces, two elements that can fight coprophagia. Weight problems: Apart from senior Pomeranians, it’s uncommon for Pomeranians to be very overweight. If your dog is carrying excess weight, pumpkin is a great fruit because it satisfies him quickly and for a longer period of time. This is very useful if you need to decrease the amount of food you give him. Nutrition: ¼ cup of pumpkin only contains 8 calories. It also has vitamins and minerals including: C, A, B6, magnesium and iron. It sits at 70 on the glycaemic index (high) but is only a 3 on the glycaemic load. The difference is what matters. The GI doesn’t consider that serve sizes of foods, including fruits, can vary so the high reading may be incorrect. The Load is based on the specific size of the serve of whatever food you give your Pomeranian. Anything under 5 is regarded as a good level. Diet: Ask your vet before adding pumpkin to your beloved pet’s diet. It’s only necessary if he has intestinal problems such as constipation and diarrhoea, as diagnosed by your vet in the first place. A puppy can have 1-2 teaspoons and an adult can have 1-2 tablespoons. Mixing it with white plain rice and plain chicken breast will make the meal more palatable. If your Pom has coprophagia, pumpkin may also be a solution. However, coprophagia is an unusual health problem in that dogs may vary in how they react to different forms of treatment. Poms may slowly develop a resistance to a treatment that does work for a while. Mango. This stone fruit is full of delicious juices and is native to the Southern Asia region. The mango is listed here among the top best fruits for various reasons. It’s very heathy in that it has plenty of vitamins and other nutrients. It’s 84% water and is low in calories. Toxic core: As with many stone fruits, the mango’s core is toxic. Be wary of this and always remove the core before feeding your Pomeranian fresh mouth-watering chunks. Otherwise he’ll try to eat through the core, which is something he may actually do, to the detriment of his health. Nutrients: a quarter of a cup of pieces of mango contains a mere 25 calories. Its many nutrients include: vitamins K, B, A and K and minerals including: beta-carotene, folate, riboflavin, manganese, folate, niacin and potassium. The mango contains more vitamin C than all foods except for oranges. 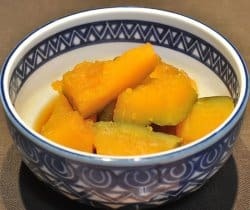 The vitamin C in mangos is a very strong antioxidant that has many benefits including: reducing cell DNA damage that may cause cancer, decreasing the risk of cataracts; improves overall cardiovascular health; acting as a natural antihistamine that can ease congestion in your Pomeranian’s chest, eases symptoms of allergies and keeping skin as healthy as possible. 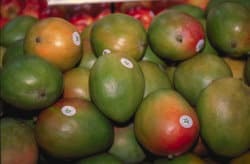 The folate in mangos helps with the creation of healthy red blood cells. Vitamin B6 helps keep your Pom’s fur, eyes and skin as healthy as possible. Diet: The ideal way to feed mango to your Pomeranian is by cutting it up into cubes. If it’s mixed in with his kibble he’ll enjoy it more and that can entice him to finish his food. The above list doesn’t contain ALL the safe fruit dogs can eat, just the best fruits safe for dogs. However, whatever you feed your Pomeranian should be in moderation. Too much of any food can cause health problems. This is a list of the fruits safe for dogs. 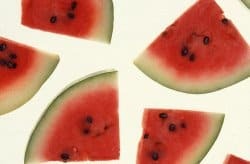 • Watermelon is 92% water and is perfect for those hot days when you want to ensure your beloved pet stays hydrated. Because it has flavour, it’s more enticing than water on its own. • Apples are good and bad. You can’t feed your Pomeranian the core or seeds but some bite-size slices will keep him healthy. • Bananas are ok in moderation. Too much may cause constipation but a few slices are fine unless your dog has kidney disease or Adison’s disease and then bananas are a big no-no. • Oranges but only the occasional slice due to their high sugar content. • Cranberries can control and/or prevent urinary tract infections. Fruits that a dog may eat but be aware of the risks. • Apricot. The pit is toxic and it’s very hard to remove the flesh from it due to its shape and size so only use apricots if you’re prepared to do the hard preparation work. • Avocado is toxic to cattle because it contains a toxin called persin. It’s not a problem for cats and dogs. However, the fact that it IS dangerous to bigger animals means it’s frequently listed as a dangerous food for all animals. If your Pomeranian eats a small amount, he should be fine but why take the chance? • Tomatoes ARE a fruit, despite much controversy. The green leaves are very toxic so if you happen to grow tomato plants, keep your dog away from them. But adding tomato to his food gives him another delicious flavour to enjoy. • Olives. The pits are high in sodium which is unhealthy for Pomeranians and so they’re best avoided. If your Pom does happen to eat a pitted olive, get him to the vet because the pit may have difficulty going through his system. • Coconut can cause bloating and an upset stomach due to medium chain triglycerides. • Cherries. The seeds contain cyanide and because it’s extremely impossible to separate them from the rest of the fruit, never feed these to your Pomeranian. • Grapes are among the most toxic foods for dogs anywhere in the world, being not only poisonous but can actually kill dogs who eat them. • Currants and raisins. Some currants are technically called grapes and there are numerous types of currants that it’s definitely a food to avoid. • Grapefruit contains psoralens and oils that can cause diarrhoea, vomiting, depression, light sensitivity and changes in behaviour. If you own a Pomeranian, or any dog for that matter, you want to ensure he remains healthy. One major aspect is feeding him only the foods that won’t harm him. You’ll find the right kibble and wet foods, as well as snacks and treats. A balanced diet is one thing. To enjoy the taste of the food your dog eats is just as important and the right fruits can provide added nutrients and flavours, while keeping his meals interesting. Fruits provide lots of extra benefits so check out the fruit section when you visit the supermarket and don’t just buy the items you enjoy. Think about your four-legged family member as well. Although he can’t show it, he’ll appreciate the extra work you have done to enable him to live a healthier lifestyle in the long term.